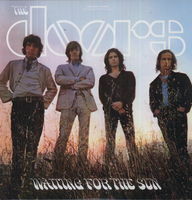 Waiting For The Sun, The Doors’ third album and its first chart-topper, delivered the No. 1 signature smash “Hello, I Love You” and the Top 40 hit “The Unknown Soldier.” The Doors' 1967 albums had raised expectations so high that their third effort was greeted as a major disappointment. With a few exceptions, the material was much mellower, and while this yielded some fine melodic ballad rock in "Love Street," "Wintertime Love," "Summer's Almost Gone," and "Yes, the River Knows," there was no denying that the songwriting was not as impressive as it had been on the first two records. On the other hand, there were first-rate tunes such as the spooky "The Unknown Soldier," with antiwar lyrics as uncompromisingly forceful as anything the band did, and the compulsively riff-driven "Hello, I Love You," which nonetheless bore an uncomfortably close resemblance to the Kinks' "All Day and All of the Night." The flamenco guitar of "Spanish Caravan," the all-out weirdness of "Not to Touch the Earth" (which was a snippet of a legendary abandoned opus, "The Celebration of the Lizard"), and the menacing closer "Five to One" were also interesting. In fact, time's been fairly kind to the record, which is quite enjoyable and diverse, just not as powerful a full-length statement as the group's best albums.